The Volunteer state is GREAT When Carly visits her cousin Teddy in Tennessee for Christmas, she discovers how amazing it is. She hikes the Great Smoky Mountains, dances to bluegrass music, tastes Nashville's famous hot chicken, and meets more than one Elvis Presley. Every day, Teddy gives her a special Tennessee gift, from 12 rockers rocking and 11 eagles nesting to a mockingbird in a tulip poplar tree. Alice Faye Duncan graduated from library school at the University of Tennessee in Knoxville (UTK). She is a native Tennessean who works as a librarian in Memphis and has written multiple children's books including Honey Baby Sugar Child and Memphis, Martin, and the Mountaintop. Learn more about Alice Faye online at alicefayeduncan.com. 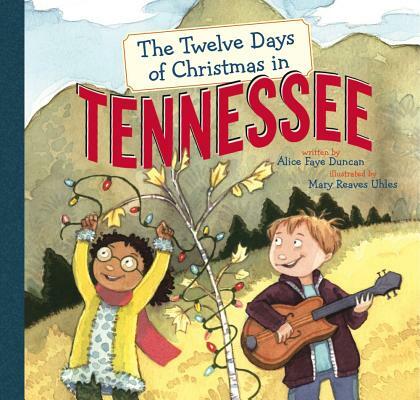 Mary Reaves Uhles has illustrated several books, including The Little Kids' Table by Mary Ann Riehle, A Tuba Christmas by Helen Wilbur, and the poetry collection Kooky Crumbs by Children's Poet Laureate J. Patrick Lewis. A graduate of Ringling College of Art and Design, Mary lives with her family in Nashville, TN.